Keep the fun going all day long with the variety of games. 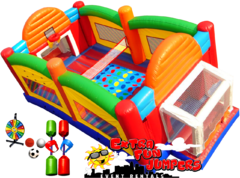 Everyone will have exciting challenges as this full sized inflatable court offers: Basketball, Volleyball and soccer. Then mix it up with a little twister action or jousting competitions! Perfect for parties and events, this game system is fun for the whole family. If you have any steps please call us for Special Arrangements.